Not every place in the world resembles heaven. However, Jammu and Kashmir is certainly one amongst those places which are known to be the ultimate stoppages for travellers. Hence, it is also considered as the quintessential abode of god. It is rightly said that each and every place in Jammu and Kashmir showcases the raw and nascent beauty of nature. From grasslands to rolling hills and beautiful rivers to enchanting lakes, there is everything in this heavenly state which is capable of alluring tourists from all over the world. Betaab Valley is one amongst these wonders of Jammu and Kashmir which have been favourite spots for travellers, tourists and even film-makers for decades. So, let's learn about this beauteous valley and what it has under its arms for its tourists. As the temperature and climatic conditions are favourable throughout the year, Betaab Valley can be visited anytime during a year. Being a favourite summer destination, it remains busy welcoming tourists throughout the summer season. If you are looking to escape the summers to get lost in the cool valleys, then Betaab Valley is the perfect spot for you this season. Previously known as Hagan Valley during the Mughal times, Betaab Valley got its new name after a Bollywood movie named Betaab,starring Sunny Deol and Amrita Singh, was shot here. As Jammu and Kashmir has been a favourite destination for the film-makers since the 1960s, there are several places in the state which are named after Bollywood movies. Surrounded by beautiful snow-capped mountains and covered with green meadows, Betaab Valley is certainly one of its kind considering the fact that it is assuredly a place where one can easily attain peace and get lost in the world of retirement. The essence of calmness and serenity can be felt at each and every corner of Betaab Valley. 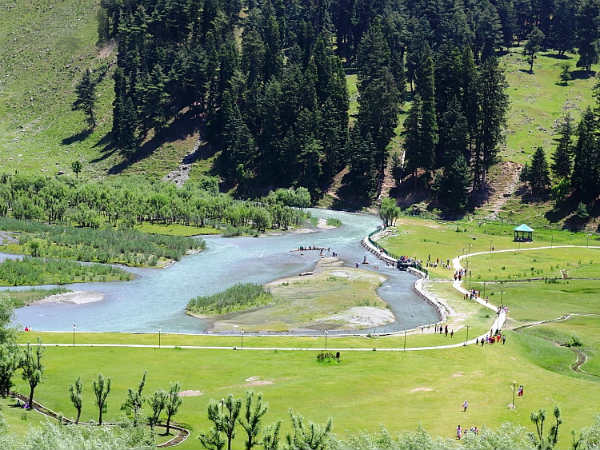 Being located in the Anantnag district near Pahalgam, Betaab Valley is visited by thousands of tourists every year. Apart from Betaab, it has also been framed in several other movies on account of its splendid nature. Apart from roaming around the grasslands and capturing the enthralling beauty of Betaab Valley, there are several other places which certainly capture the attention of tourists and travellers. The major places which you must not miss visiting in and around Betaab Valley include Lidder river, Pahalgam, Overa Aru Wildlife Sanctuary, Tulian Lake and Lidder Amusement Park. Betaab Valley not only allures nature lovers and photographers but also a bunch of adventure lovers. Due to its hilly terrains and sloppy regions, it is also a perfect spot for trekkers and campers. Being surrounded by the towering range of mountains, Betaab Valley acts as a base camp to several trekkers. You can also go horse riding and laze by the river beaches in and around the region of Betaab Valley. Not everywhere you can find such a flawless beauty of nature. So, why refrain from packing your bags and being on the route to Betaab Valley? On one hand, you can photograph the scenic locations and on the other hand, you can go trekking and camping. So, how about relishing this blend of perfect nature this summer? By Air: The nearest airport from Betaab Valley is located at Srinagar at a distance of about 96 km. From the airport, you can hire a cab to Betaab Valley. By Rail: You can get on a train to Srinagar railway station, which is situated at a distance of around 90 km from the valley. From the railway station, you can either catch a bus or hire a cab to Betaab Valley. It will take you an approximate time of 2 hr. By Road: Betaab Valley is easily approachable by road.